Before I was bitten by the puppetry bug as a teenager and became obsessed with puppets, I spent a great deal of my time drawing and making up characters on paper. All throughout elementary school I was often pointed out as being "the artist" in the class, no matter what grade I was in. At first I taught myself how to draw popular cartoon characters such as Popeye, Garfield, Pink Panther and so on, then in my early teens I discovered superheroes and have been drawing them ever since! That being said, my artwork has always been somewhat cartoonish so I've never considered it to be as exceptional as the kind you'd find in a DC Comics comic book. None the less, I'm quite proud of my artwork and find it well suited to my particular sense of humour. Drawing is something that I enjoy immensely, especially when I'm making up my own characters. So with that in mind, I've compiled this blog page to present a few of my own original superheroes. Enjoy! 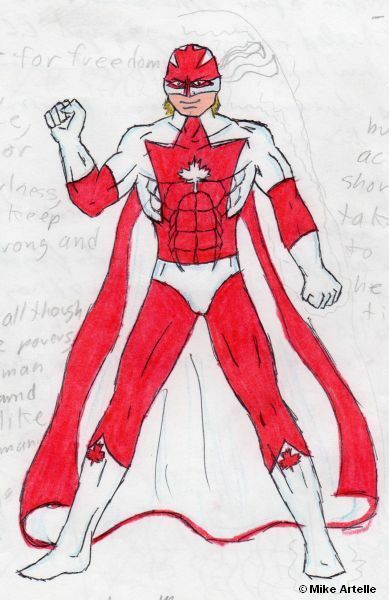 This is the very first drawing of my patriotic superhero Canadian Crusader which I created sometime between 1987 and 1991. 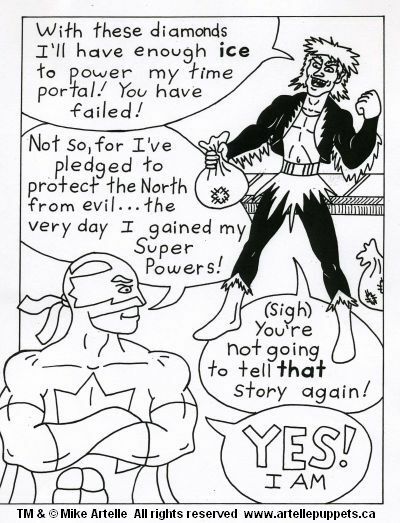 During my mid to late teens I drew comics about Canadian Crusader for fun and created his entire backstory. 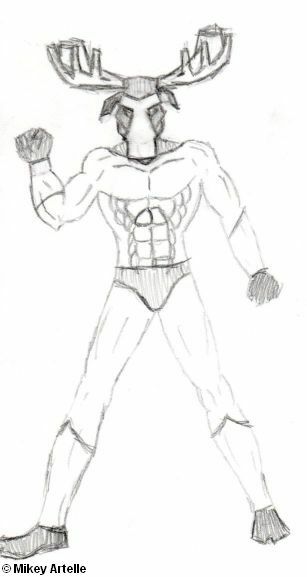 Although I was a teenager, when it came to designing his costume I knew enough to do my due diligence as any professional artist would do, so I researched other Canadian superheroes of the day to avoid copying someone else's design, and have acquired a registered copyright for this drawing. Of course my research was done well before the internet had become so widely accessible, so I had to do things the old fashioned way at the public library. Now a days, with the ease of the internet there really is no excuse for accidently copying another artists work due to lack of research... or ones laziness to do so. 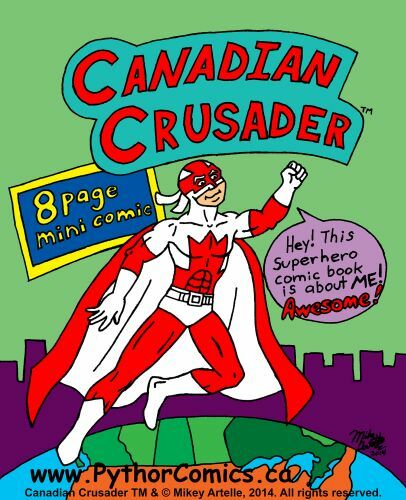 In addition to the copyright, I also own Canadian Crusader as a registered trademark. In 2014 I made this Canadian Crusader mini comic book based on my "Heroes Past and Present" live show. Included in the comic is the origin story which shows how RCMP officer Melvin Maples becomes Canadian Crusader. This and several other of my mini comics can be read for free on this blog. I've also posted my Mini Comics on the Pythor Comics website. 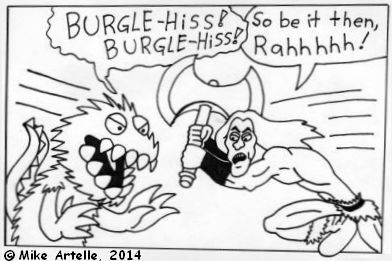 Here is another drawing of Canadian Crusader from the mini comic, along with his evil nemesis Icicles Man! Canadian Crusader also has some official merch! Here is the first Canadian Crusader T-shirt!!! Canadian Crusader's side kick is Blue Jay Boy. Above is the mini comic featuring Blue Jay Boy, aka Troy McKenzie! When I first became interested in comic books during the 1980's I was in my early teens. Back then there weren't any gay superheroes for me to relate to or admire. Even today it's still an anomaly for a main superhero character to be gay. 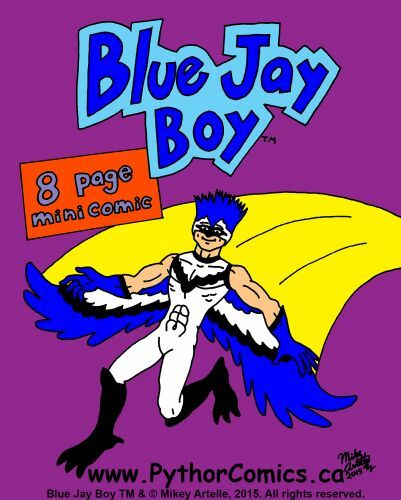 Therefore I'd like to include some gay characters in the Pythor Comics superhero universe, and my first gay superhero is Blue Jay Boy! 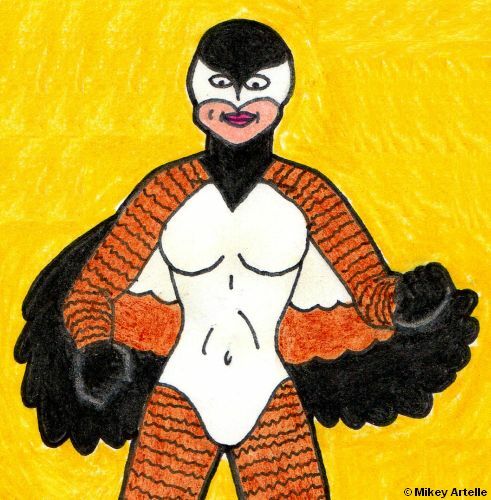 I've also posted the Blue Jay Boy mini comic here on Mikey's Art and Puppetry Blog, and on the Pythor Comics website. 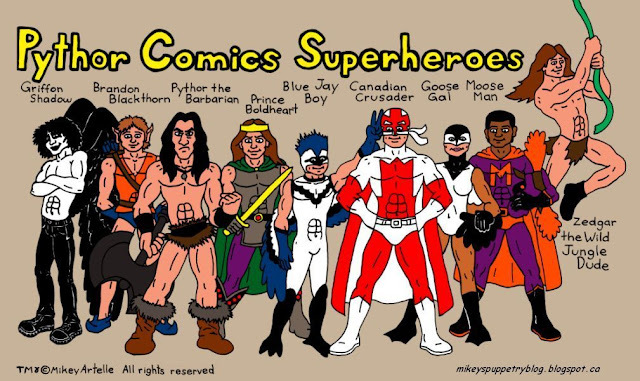 Also joining my superhero lineup are Moose Man and Goose Gal. 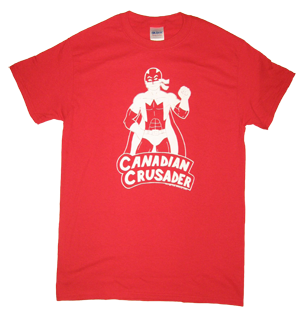 Together, with Canadian Crusader and Blue Jay Boy, this patriotic team of heroes is known as... the Canuck Crusaders! Recently I've been working toward getting some toy puppets of my hero characters commercially manufactured. 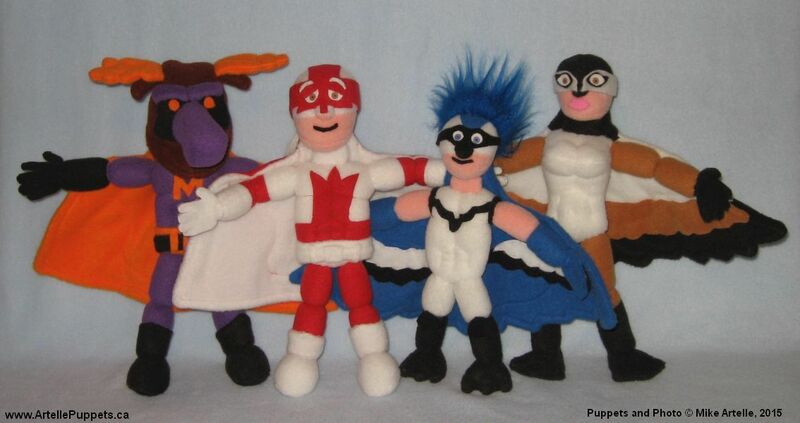 Above are my prototypes for the Canuck Crusaders puppets. 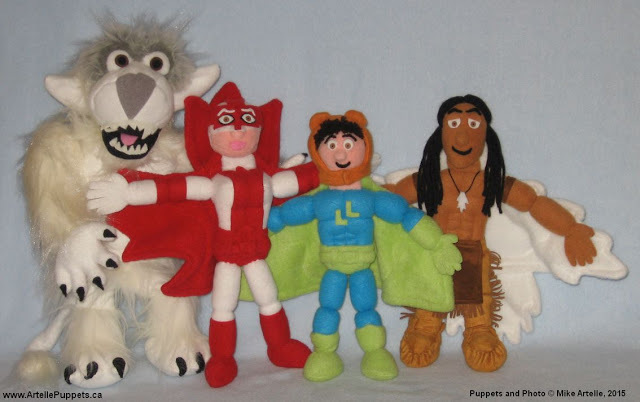 These are smaller 12 inch hand puppets as compared with my original superhero puppets, which are roughly 20 inches tall. 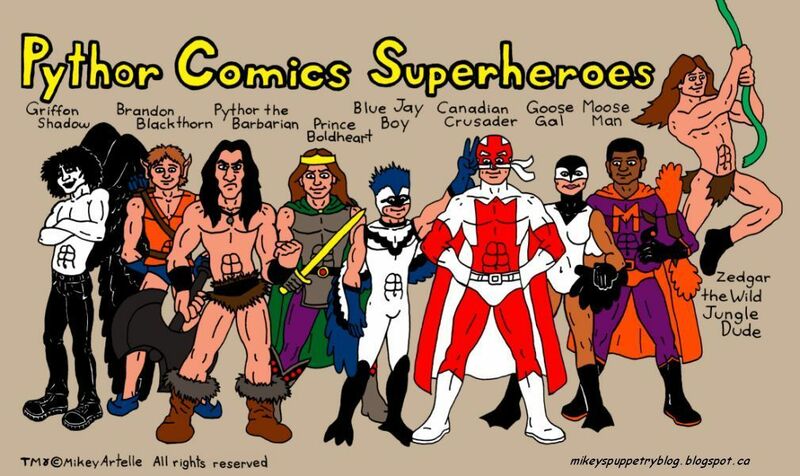 In all, I've completed prototypes for 16 characters from my Canadian Crusader storyline, which are seen below. Above is a colour mock up showing Moose Man unmasked, this is his alter ego Harry Harrison. This is a more recent sketch of Goose Gal, from 2011. My original drawing of her was quite bad and will remain in the vault indefinitely! Unfortunately I'm not as good at drawing women as I am at drawing muscular male superheroes! 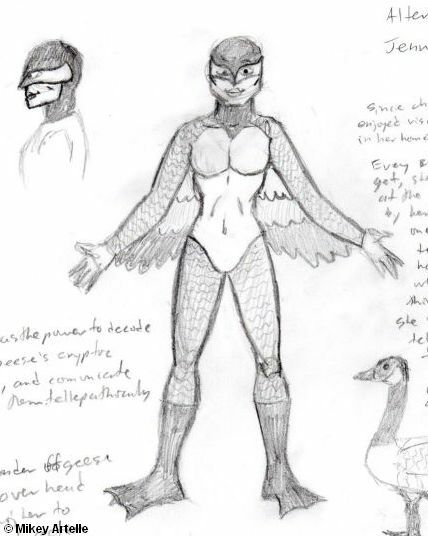 Here's the colour mock up of Goose Gal, the alter ego of Jenny Featherstone. 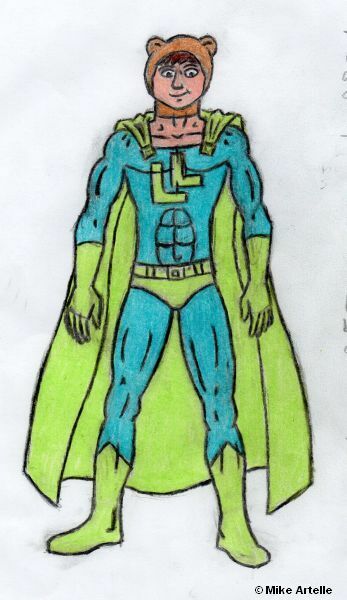 Meet Lemming Lad, aka Donald Keener! He's the secretary, accountant and logistics organizer at the Canuck Crusaders' team headquarters. Keener doesn't have any super powers, he just wanted to fit in with the gang so he wears a costume. He's a little guy and shorter than all the others so he chose Lemmings as his theme because they're small too. I drew this picture on February 14, 2015. Lemming Lad is included as one of the prototype toy puppets that are part of the Canadian Crusader series, shown below. 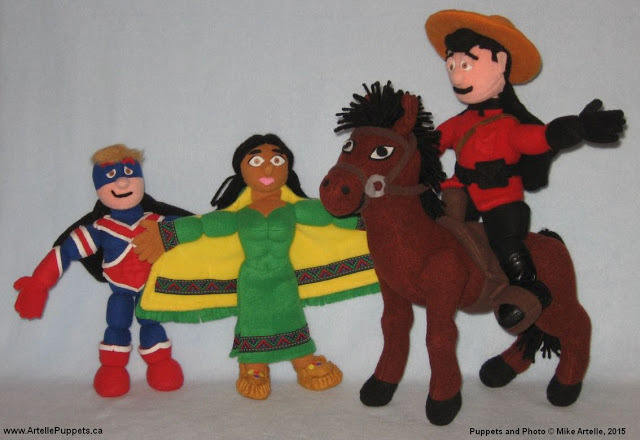 Shown here are Avalanche the Snow Beast, Countess of Canada (Canadian Crusader's sister), Lemming Lad, and a time traveler from Canada's historic past, Flying Wolf an aboriginal warrior. 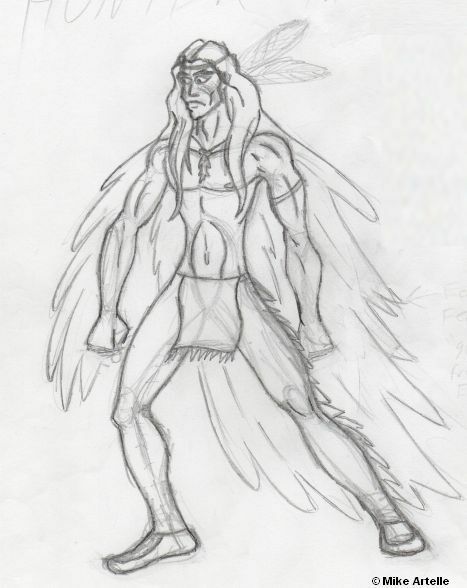 Flying Wolf is the alter ego of River Wolf, a crossover character from the stories about Pythor the Barbarian discussed on the Fantasy Characters page of this blog. Pythor and River Wolf have been best friends since childhood.... but how does River Wolf end up in the future with the alias Flying Wolf? Well, when I finish writing that story, I'll let you know! 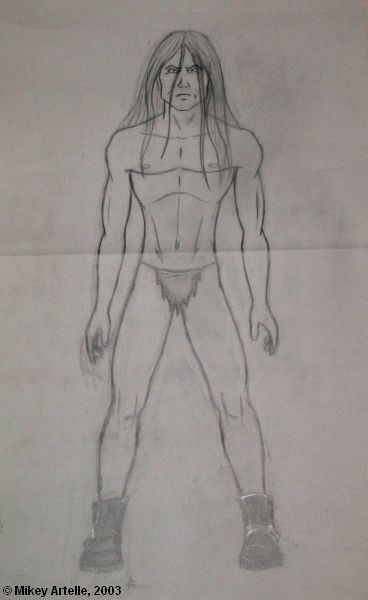 :) Below is my original drawing of the character. This is the first drawing that I did for Flying Wolf , created on October 3, 2005. I've since omitted the feathers on his head from later drawings. Here's Dominion Kid, the alter ego of Ricky Sweetbottom. 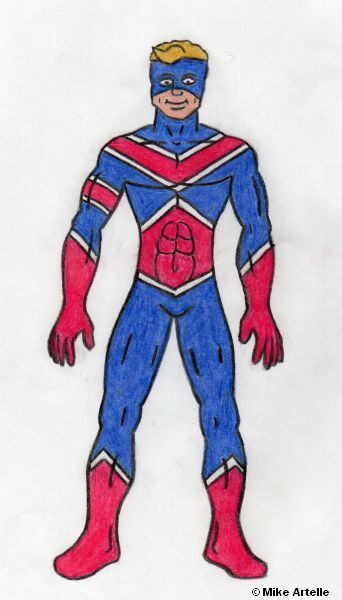 His costume is based on the Union Jack flag. Dominion Kid doesn't fly so he has a really cool motorcycle which also has a Union Jack design. When I get around to doing the comic books with Dominion Kid in them, he's going to be Blue Jay Boy's boyfriend (I already have the books roughed out). I think they would make a nice couple, we'll see! This drawing is from February 2015. 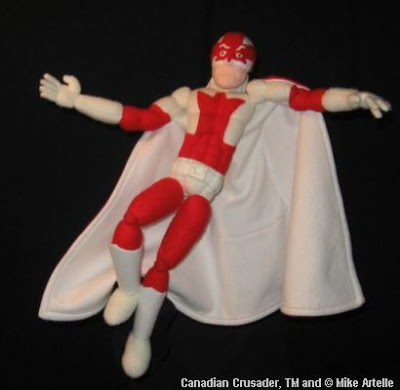 I've made a prototype toy puppet of Dominion kid for the Canadian Crusader series, shown below. Shown here are Dominion Kid, Buffalo Queen, Canadian Crusader's alter ego Melvin Maples, and Melvin's horse Pancake. Here is the panel from the Canadian Crusader Mini Comic in which Melvin Maples is rescued by the Buffalo Queen and she gives him his super powers! Canadian Crusader's arch nemesis is Icicles Man, a cold hearted scientist and inventor. His hideout is an evil igloo laboratory and he has a space ship called the Iceberg Orbiter! When I performed my puppet show "Heroes Past and Present" at the Puppets Up festival in 2006 Icicles Man was the main villain of the story, and caused trouble for Canadian Crusader. Here is their climatic battle scene that was choreographed to some campy disco music. At the time the puppet of Icicles Man was actually one of my other characters, Griffon Shadow, dressed in Icicles Man's costume. 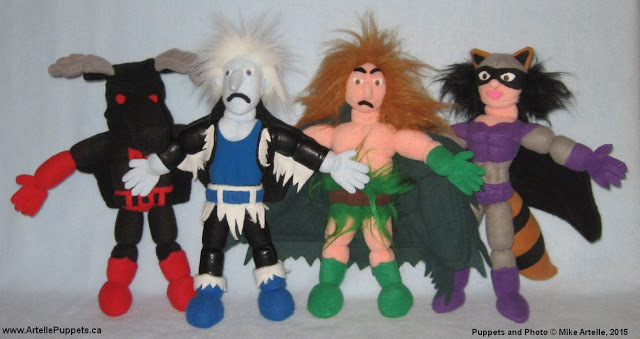 Icicles Man is included among the last bunch of character's for the Canadian Crusader prototype toy puppet series, which are all nasty villains: Mad Moose, Icicles Man, Wilderness Man, and Raccoon Woman! Eventually I'm going to make some stuffed vehicles for my superhero prototype toy puppets as well, which will also be seen in future comic books. For example, Wilderness man drives a Beaver Launching Log Mobile (the beavers are his robotic minions!) while Blue Jay Boy has a Bird Nest Go-Cart. Canadian Crusader has a cool car named the Canadian Cruiser (even though he can fly! ), and Moose Man drives the Moose Mobile! Although Goose Gal can fly she also has a space ship called the Goose Glider! Meanwhile Canadian Crusader's sister, Countess of Canada, drives a stylized dune buggy called the Maple Leaf Mobile! At some point from 1987 to 1991, when I was in my mid teens, I became interested in drawing superheroes. In fact I was comply hooked on them. 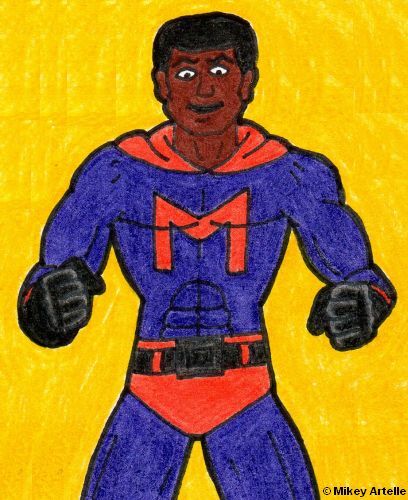 In addition to drawing DC Comics heroes and a few characters from Marvel Comics, I spent a lot of time designing my own characters. 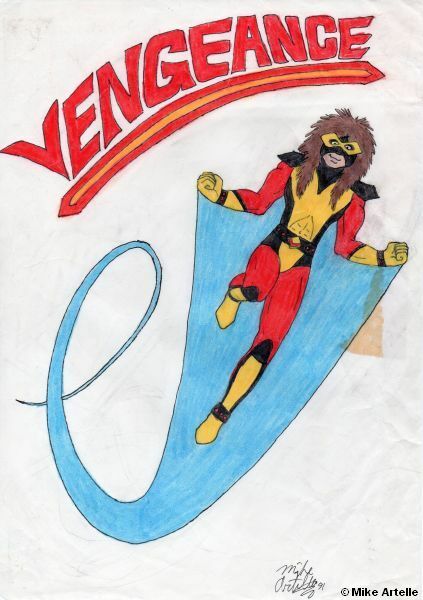 Above is a drawing of my superhero Vengeance from 1991. 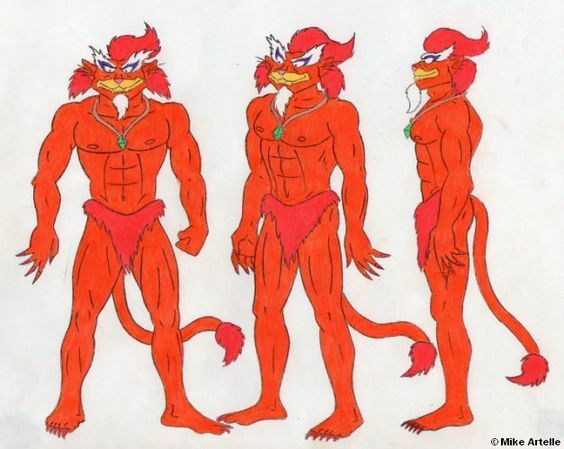 His character is based on "hair band" Heavy Metal music that was popular at the time. Just for my own amusement, I drew a comic book about Vengeance which established that he's a rock band drummer by day and superhero by night! 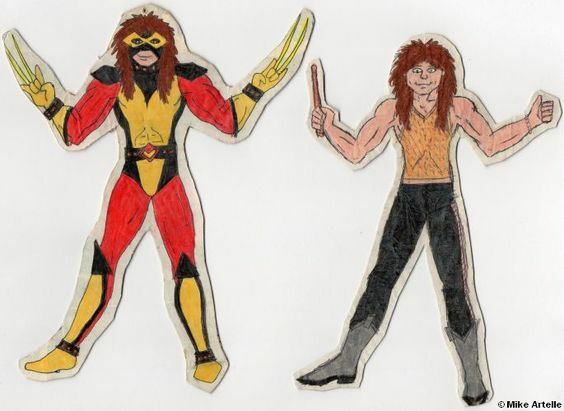 These are cut-out cardboard dolls of Vengeance and his alter ego, the rock star drummer. The figures are illustrated on the front and back so that I could hang them from a shelf with a string. They're seven inches tall and were made in the early 1990's. 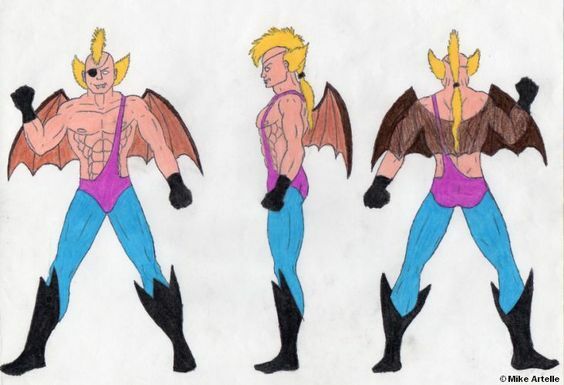 Below is a similar seven inch paper doll of Vengeance with his superhero costume and all of his rock star outfits! The alter ego figure is a card board cut out, just like the above figures, but is only illustrated on the front. I'm a huge fan and collector of the 8 inch Mego superhero dolls that were produced in the 1970's. 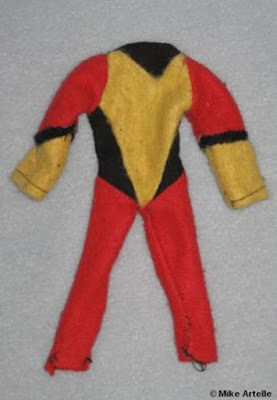 In the late 1980's I made this Vengeance 8 inch doll costume for my Mego dolls. It was a challenge to figure out the pattern with all the different colours and shapes. 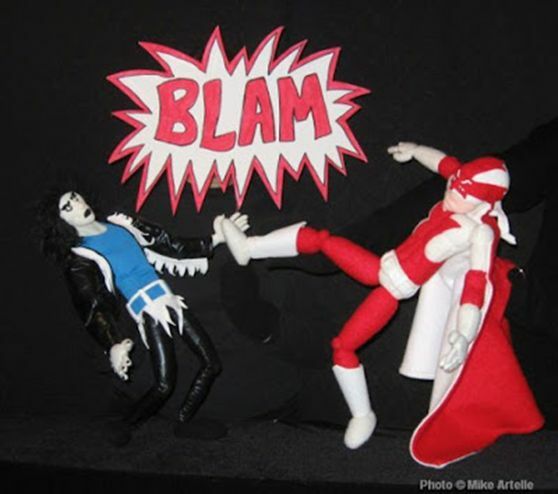 One of my other blogs called Mikey's Dolls has pictures of my entire Mego doll collection. Here is a Catman! I've always thought he was cool. This was created for an assignment in which I had to design a character and draw the face with different expressions (one of them is shown above), as well as full views from different sides (below). After I got the assignment back I coloured it! 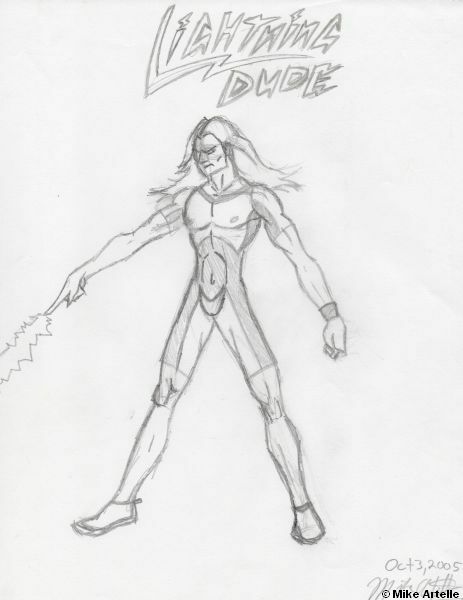 I'm forever inventing new superhero characters. 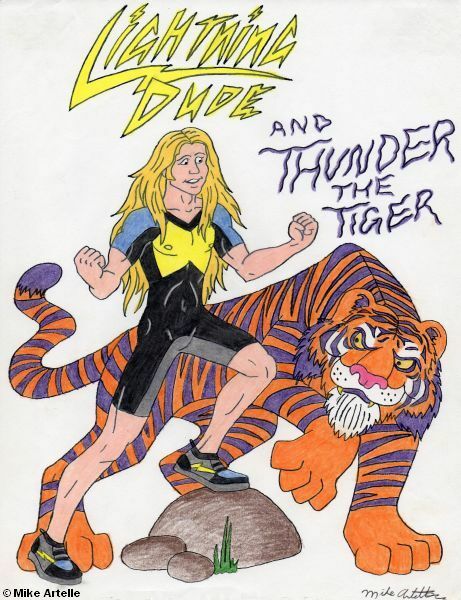 Here's Lightning Dude and Thunder the Tiger! I created this picture on September 12, 2002. 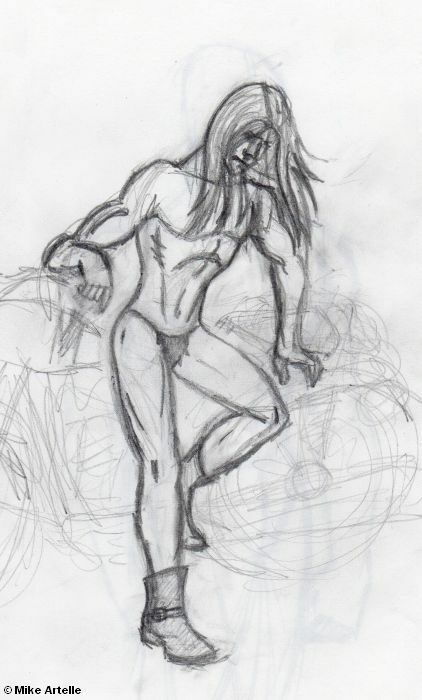 The sketch below shows another version of the character, created October 3, 2005. 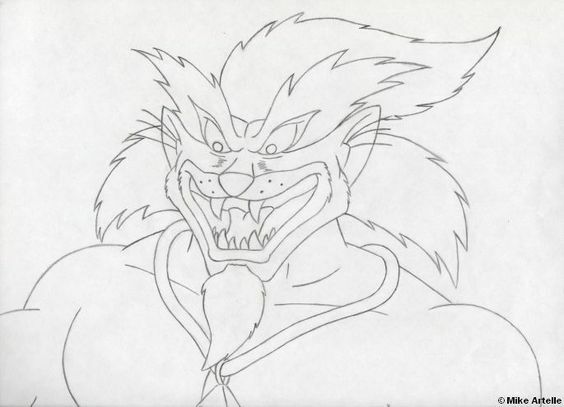 Another drawing of Zedgar from 2003. This drawing is on a large 14 X 26 inch piece of card stock similar to Bristol board. The picture was folded through the middle for storage. Zedgar looks quite intense in this picture as originally I thought of him as a brooding, angry character. A much happier version of him appears in the mini comic book, below. 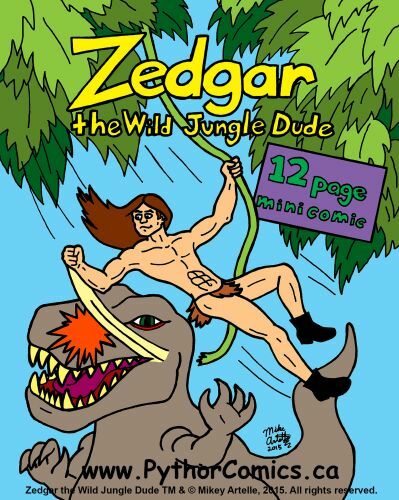 I've created a 12 page mini comic about Zedgar and posted it online. It shows him being chased around by dinosaurs and lion-like cat people. Poor Zedgar! You can read the comic for free on another page of this blog. 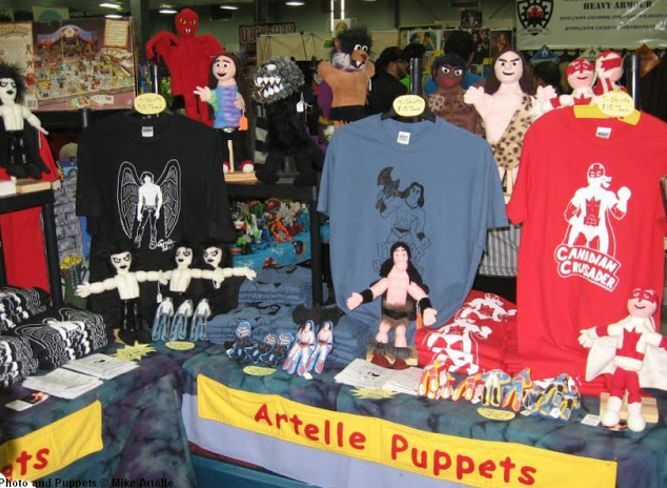 In September 2014 Artelle Puppets had a booth at Ottawa Geek Market. Shown above is my display of superhero items including hand-made puppets, hand-made and illustrated stuffed superhero figures, mini comic books, and three different T-shirts for Griffon Shadow, Pythor the Barbarian and Canadian Crusader. These are all available on this blog and on the Pythor Comics website. Here I am in March 2016, when I was 42, with some of the superhero puppets on display in my workshop.